Caitriona Matthew lifts the Irish Open trophy. CATRIONA MATTHEW IS the 2012 Ladies Irish Open champion after she finished on -7. The Scot led for most of the event at Killeen Castle in mEath but was caught by last year’s winner, Suzann Pettersen, by the 15th hole. Matthew, who was playing alongside compatriot Carly Booth (level par and joint seventh place), also rattled in a birdie on 15. Pettersen then bogeyed 17 and Matthew carded a birdie on the same hole just 20 minutes later for a two shot swing. The 42-year-old could afford to bogey the last and still claim the Irish Open trophy. Two putts were enough to seal the win and the €52,500 first prize. I made a good birdie on 15 and then the one on 17 just gave a little bit of a cushion coming up the last, which was nice. I knew I had a two shot lead and I had seen what Suzann had done on 17 and 18 so I knew she was two behind so I reckoned I could make five from there. Pettersen was happy with her -6 showing on the final day but was left cursing her ‘silly bogey on 17′. Laura Davies of England was third after her round of 68, which included seven birdies, left her on -3. England’s Curtis Cup winner Charley Hull ended in a share of 18th place, taking home the Philomena Garvey trophy as the leading amateur. Ladies Irish Open Tournament Director, Roddy Carr commented, “We are delighted that Catriona has joined the impressive list of Irish Open champions. On the opening day of the tournament, dubbed ‘Pink Friday’, players and spectators wore pink as part of a charity initiative with raised over €2,000 raised for Breast Cancer Ireland. 17-year-old Leona Maguire was best of the Irish but her score of +8 was not enough for her to advance to the final day’s play. Email “Queen of the Castle: Matthew wins Ladies Irish Open”. 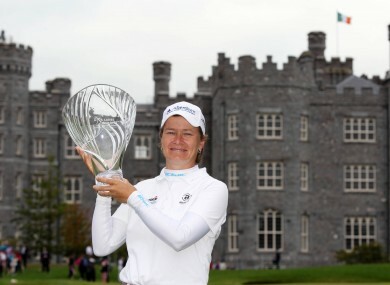 Feedback on “Queen of the Castle: Matthew wins Ladies Irish Open”.